3 November 2016 - It is pure brilliance. Mischief Theatre’s smash-hit disastrous comedy Peter Pan Goes Wrong returns to the Apollo Theatre London for a limited festive season. After delighting audiences and critics alike in their sell-out 2015 run, the pants pantomime was recently nominated for Best New Comedy at the 2016 Olivier Awards. 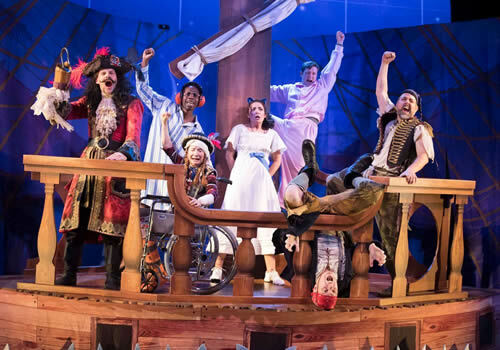 Peter Pan Goes Wrong sees the ill-fated Cornley Polytechnic Drama Society return once more in an attempt to showcase their latest production of J.M Barrie’s Peter Pan. Whilst desperately trying to take the audience to Neverland, the unlucky team encounter a variety of technical hitches, cast disputes and set malfunctions which dramatically hinder the production. With plenty of laughs, disasters and hilarious calamities, Peter Pan Goes Wrong is the ultimate comic treat. Previous cast members included masters of Mischief Theatre, Henry Lewis, Jonathan Sayer and Henry Shields alongside Dave Hearn, Charlie Russell, Greg Tannahill and Nancy Wallinger. With this cast moving to the Criterion Theatre to appear as dastardly thieves in The Comedy About a Bank Robbery, Peter Pan Goes Wrong promises to include an entirely new but equally hysterical cast. The show’s initial creative team included director Adam Meggido (Showstoppers! The Improvised Musical), with lighting design by Matt Haskins, sound design by Ella Wahlstrom, costume design by Roberto Surace and a set design by the innovative and highly-praised Simon Scullion. With the ever-increasing success of The Play That Goes Wrong, which has recently extended its run, as well as the opening of The Comedy About a Bank Robbery, Mischief Theatre are proving to be one of the most prolific companies on the West End. Peter Pan Goes Wrong flies into London’s Apollo Theatre on October 20th and is set to run until January 29th 2017. Peter Pan Goes Wrong is relatively family-friendly, with plenty of laughs for children. Young children will not be admitted into the theatre.